Do you have a troublesome scar? At Serrão Rejuvenation Center, Dr. John Serrão, a board certified gynecologist and post-graduate trained cosmetic surgeon, offers scar revision for women in Orlando, Winter Park, and the surrounding areas of Florida. Why do scars look so different compared to the skin around them? Scars may have a different texture or color. The answer is found in the mechanism by which your body heals a wound. When your skin suffers an injury, your body starts to produce more collagen fibers. The threat of infection and blood loss is viewed as an urgent situation, so the collagen fibers are laid out in an erratic manner. The goal is to close the wound quickly rather than maintain the aesthetics of the area. Scar revision is a procedure that resurfaces the outermost layer of skin so that it blends better with the skin around the scar. Although the scar cannot be eliminated, it is much less obvious. Acne Scars – Acne scars are a direct result of cystic acne or prolonged chronic acne. Reducing the appearance of acne scars has always been difficult. Prior to laser scar treatments, the available choices were mechanical dermabrasion (a wire brush that removes the top layers of skin) or deep chemical peels. Deep rolling or “boxcar” scars resulting from cystic acne – Treated with Alma Pixel or Palomar Lux 1540 Laser. Icepick scars resulting from deeply embedded cystic acne – Treated with Alma Pixel or Palomar Lux 1540 Laser. Keloid scars (raised firm “hypertrophic scars”) are an occasional response to acne. Keloid Scars are treated with cortisone injections to the scars and laser therapy. Trauma and surgical scars – Scars from accidents or surgical procedures can be painful visual reminders of what you went through as well as being disfiguring. A series of treatments help soften and minimize the appearance of these scars. Scar revision can be done surgically by cutting around the scar and shrinking its size, but this may still leave an uneven area of skin. At Serrão Rejuvenation Center, we use fractional lasers and ablative radio frequency technologies to resurface the scar. When our patients refer their friends and family to our practice, we know that they are thrilled with the results of their scar revision procedures. Dr. Serrão is an expert scar revision physician who treats a variety of scars with advanced procedures. Don’t let that scar trouble you any longer. 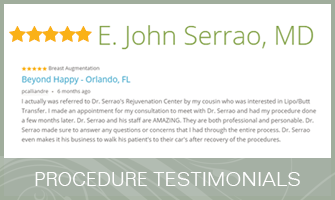 At Serrão Rejuvenation Center, Dr. John Serrão, a board certified gynecologist and post-graduate trained cosmetic surgeon, offers scar revision for women in Orlando, Winter Park, and the surrounding areas of Florida. To learn more, contact us to schedule a consultation and begin your rejuvenation today. “Scar revision” is a phrase that describes cosmetic procedures to reduce the appearance of a scar, either in size, shape, texture, or color. It is not referred to as scar removal because no scar can be completely removed from the skin. We use cosmetic technologies that remove the damaged outer layer of skin to reveal smoother, younger skin that is under the scar. You may need several treatments to reduce the scar to your satisfaction. How Long is the Recovery from Scar Revision? The skin of the scar may be sensitive for a period of time, but you only need to protect it from sunlight, as this can darken the skin. We may recommend an ointment to help the scar heal properly. The cost of your scar revision procedure is based upon the type of procedure, location, size of the scar, and several other factors. We know this level of detail after your consultation. Should you be interested in making monthly payments for the cost of scar revision, we invite you to learn about our financing options.